Why do they bother feeding us such lines when any sportsman of any sport, and particularly those who have learned that seven Tour de France wins equates to cheating, would accept that headline as valid? 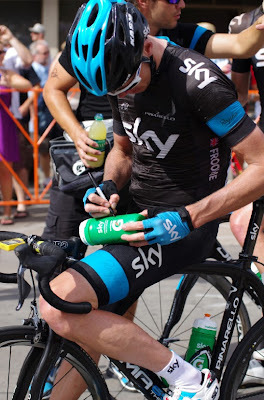 I am sorry Chris Froome, as much as I respect your ability to bury yourself in your SRM power meter and climb to the heavens, you really should not win the 2014 Tour de France. I say this based on the idea that the same horse should not win the Kentucky Derby every year, or the same football team usually does not win the Superbowl every year. Luck and statistics. It stands to reason that if the route changes, one's teammates change, and the human body changes in optimal fitness from year to year - that the likelihood of the same man being victorious in a game with high variables should be grim. If it happens, marvelous, but at this point in the sport it does not assure credibility. Yes the journalists need to talk about something preseason, and yes the fans need to know who to select for their fantasy teams come game day, but the sport of cycling would be much better off to share the spoils among varied riders and varied teams. Every time one rider rises far far above the peloton in terms of results, we will cry "big budget" and "doper" because we have learned from the past. For the next eight years I would be very happy to see eight different men win the Tour de France. Then I might believe that the credibility of cycling is beginning to be restored. It is not necessary that the best man be the same man, it is preferable that the game be played fairly. After a year when I believed the sport of cycling to be in utter disrepair and in need of complete rebuilding; I have accepted that the race will go on with slow painful changes. I would be happy to see Chris Froome show up to race his best and bring his elusive teammate Bradley Wiggins right along with him regardless of the one GC man preference. Quality competition remains the goal, and as much as I cheer the dominant athletes Michael Phelps or Shawn White's repeated wins, for the health of the sport of cycling, it is perfectly okay if neither Froome nor Wiggins ever won again. Once is gloriously enough.